Ruth Conklin was born in Chicago, IL in 1938. She received her B.A. from Goucher College and her M.Ed. in Education from the National College of Education in Evanston, IL. She has studied at the Art Institute of Chicago, Northwestern Michigan College, and the John Campbell Folk School in North Carolina. Ruth is an accomplished printmaker and woodcarver, and continues to expand her artistic repertoire using acrylics, oil and pastels. As artist and business owner, Ruth unwaveringly creates with her audience in mind, a significant contributing factor to the ongoing success of her gallery in a fluctuating economy. During the winter months she spends in Florida, Ruth produces new works from sketches and photographs she accumulates throughout the “high” season. Those who have known Ruth’s work for years look forward to returning annually to discover her fresh, original interpretations of their favorite northern Michigan places and experiences. Ruth works with a rich, deepened palette of color using acrylics and pastels to portray the spirit of the Michigan landscape. Her longtime favorite color is purple, which she uses to illustrate the dramatic distinction between light and shadow. Each piece is a direct reflection of her own profound love of the northern Michigan region. Ruth’s 6” x 6” landscape paintings are especially popular, as they are easily transported and sit comfortably on a desktop or mantel as a fond reminder of the northern Michigan experience. Ruth’s unique wood collection is one of the Glen Lake area's most sought-after souvenirs. Her “Legend of the Sleeping Bear Dune” stools depict the origin of the Manitou Islands through the poignant story of a mother bear, her two cubs, and their journey from Wisconsin to the distant beckoning shores of Michigan. 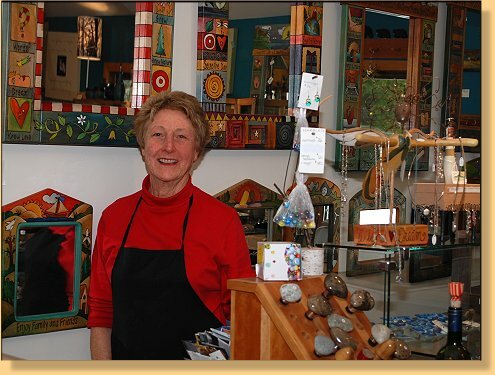 All of Ruth's paintings and northern Michigan story art are subject to availability. Ruth’s beautifully hand-carved/burned pieces are a decorative yet functional addition to any home. Don’t forget to ask about other wood collection gift items, including photo frames, boxes, key holders, tissue holders and clocks! All artwork is subject to availability. Please don’t hesitate to inquire if you see a piece you would like to purchase – we’re always delighted to be of assistance.